As Widespread Panic enters their fourth decade as a band, they cap off their first thirty years with a mighty bang. Taking their freewheeling spirit all the way back to its core, WSP recorded their 12th album, Street Dogs live in the studio. The result is as close an account of their legendary live performances as they have ever been able to capture in the studio. With drummer Todd Nance on extended leave, Duane Trucks has been performing with the band for about a year and he extends that duty to this album. While it’s odd to imagine a Panic album without the rock-solid Nance holding it down, Trucks does a magnificent job, adding a looser swing to the band’s sound without messing with the formula too much. They kick things off with a super funky take on Alan Price’s “Sell Sell”, a song that previously appeared on their 2012 acoustic live box set, Wood. While both takes are nice and swampy, this version sets the stage for what can only be another solid album from this band. 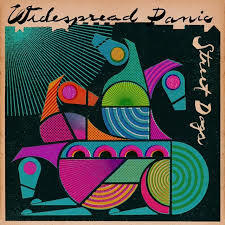 Given that they write by committee, it could be easy for Widespread Panic to fall into that trap where their songs just sound like jams with vocals added on top, but that tendency seems to be a bit tempered here, especially on the exquisite “Steven’s Cat”. While the song itself, with its punchy chords, dramatic build-ups, and dynamic contrasts, could be considered paint-by-numbers WSP, it is still a killer track, one of the best since 2003’s Ball, and this is a sure-fire contender for the album’s single, should there be one. One of Widespread’s great strengths has always been in their song pacing. There is always careful attention paid to their setlists (even though they change every night), with all the light and dark and rise and fall in all the right places, and that is something that carries over to their albums as well. Case in point, the eight-minute, jazzy “Cease Fire”, which finds the band really exploring the spaces between the notes – a perfect simmer after such a hot opening salvo. Guitar god Jimmy Herring continues to prove his worth with not only his burning solo during the tripped-out jam that closes the song, but also in his atmospheric chording in the body of the song. As it surely would do in a live show, this soon melts into a slow burning jam that segues seamlessly into the next track, “Jamais Vu (the world has changed)”, a long, mellow number that reminds me of their classic, “Blue Indian”, recast as a sleepy, late night, rainy night blues. Taking inspiration from the aforementioned Wood album and tour, “Angels Don’t Sing The Blues” features acoustic guitars and some really inspired band interplay, including more stellar soloing from Jimmy Herring and some great drumming by Duane Trucks and percussionist Sunny Ortiz. The second of three cover songs is the dark and dirty “Honky Red”, an obscure cut from Canadian singer/songwriter, Murray McLauchlan. Typical of Widespread, they took this song and totally made it sound like their own creation. In fact, had I not already known it was a cover I would’ve been shocked to discover it wasn’t their song. They completely own this track. Most of the songs on this album are sung by front-man John Bell. As they probably should – to this day, there is no singer in the entirety of the “jamband” universe that can come anywhere close to being as good a singer as Bell. From his gritty snarl to his backwoods holler to his mellow, storyteller voice, he is as engaging a vocalist as you might ever find. That said, however, he gives up the mic, from time to time, most often to keyboardist Jojo Hermann. His output might be slimmer than Bell’s but his songs are always some of the most fun, and his two offerings on this set are no less. The first is the mid-tempo country-rock of “The Poorhouse Of Positive Thinking”, one of his most mature numbers (and, no doubt, his greatest song title), and a perfect kind of song to drunkenly strum on an acoustic guitar by a campfire. Jojo’s forte is his New Orleans-inspired piano playing and there is plenty of that in the breaks between the verses. Jimmy Buffett couldn’t write a better song. Following that bit of sunshine is the dark and heavy “Welcome To My World”, because Widespread always loves to take it there. A solid song with some blistering slide guitar and a swift rock groove, this is the kind of number that makes you want to drive fast. It’s not my favorite song on the album but I can imagine this really getting a crowd riled up and I am looking forward to seeing them play this one sometime. From there, they keep up the pace with Willie Dixon’s “Taildragger”, a song they have been playing live for a number of years now. That time spent in the setlist has really given the band a strong handle on this tune, especially in Dave Schools’ thunderous bass bombs. Sometimes it gets to be a little too “blueshammer” for me, but it is still a tight track that showcases the band’s strengths. Closing out the album is Jojo Hermann’s second offering, “Street Dogs For Breakfast”, a loose, swingin’, good-time sounding number with a kind of a low-life, rock-bottom sort of lyric that totally fits the song’s Tom Waits-inspired title. A killer way to close this album, knowing that this was recorded live makes it feel all the more right. It’s clear that Widespread Panic is in it for the long run. 30 years in and no sign of stopping, they could still very well be in the mid-life of their career. And even though Street Dogs might not be as vital as albums like Bombs & Butterflies and Til The Medicine Takes, this is still one of their finest latter-day albums. « King Street Blues: An Old Town Original! Chris- I really enjoyed reading your poetic and inspiring review of Street Dogs. Your review reminds me to enjoy the band’s ongoing evolution wherever they take it to keep it real for them. I was very pleasantly surprised to see news of Panic when thumbing through the copy of the Crier in the mail. I will definitely pay a bit more attention to the Crier from now on. It’s also apparent you enjoy Widespread Panic and appreciate their talents as quintessential Southern Rock Jammers. I don’t know many 30 somethings (me) in the “greater Alexandria” area who understand how seasoned the band has become and, particularly with Herring getting truly folded in, have evolved into rock and roll artists who really shred with their riffs and, as you astutely note, their lyrics. I have been enjoying Street Dogs, but have not gotten as attached to it as I am with Dirty Side Down, an album which really means a lot to me as a longtime Panic fan who previously compared every release to “Til the Medicine Takes. I was a bit concerned after first listen that Street Dogs was too back alley blues for me, but I will listen to Street Dogs with ears anew. Funny you should mention Dirty Side Down. That was one album that I never quite got attached to and, in fact, is the only WSP release that I do not own on CD. Perhaps it was because much of the album is filled out by songs that had been in their set for over a decade, the ones that seemed to be those live-only songs, I felt that perhaps they were a bit short (kinda like if, all of a sudden, Phish decided to put “Harry Hood” and “Suzy Greenberg” on an album). A silly reason to judge an album and, after you held it up there with Til The Medicine Takes, I will surely give it another go and I’m looking forward to hearing that album, likewise, with ears anew!